Jesse K: Good news, Jesse T! I figured our expertise is in the field of criticizing things we could never possibly create, so I signed us up to be judges at the Inventors’ Fair! 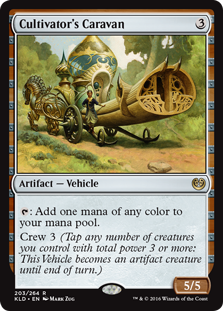 Our first assignment is to take the vehicles of Kaladesh out for a test drive. It’s hard work buying a vehicle, so we’ll separate the lemons from the night riders for you. Just adjust your rearview mirrors, turn on your seat warmers, and set the cruise control. We’ll take the wheel. 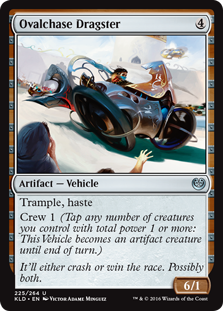 Jesse T: The Inventors’ Fair, not to be confused with the pod race scene from The Phantom Menace, is one of the biggest auto expos in the multiverse. While Jesse K is right, and buying a car is a big responsibility, that’s not what you’re here for. If you can afford gas and insurance, you’re probably already a member of the ultra-wealthy business elite. You’re here for the thrills. You were young and virile once, and you need a vehicle that lets everyone know that. I’ll help you figure out which cars will finally impress those condescending teenagers from Freejam who hang around outside the mall all day, and which ones will just make you look like one of their loser parents. Buckle up, and hold on tight to your fleeting youth. We’re off to the car show! K: It’s training day, and I finally get to be Denzel Washington. This is a sweet ride and I’d be happy to pilot this train. Probably not as thrilling as it could be, given the responsibility of making sure everyone gets to work on time. Given my experience with mass transit systems, its power level seems on point, but to be more accurate it should probably have 1 toughness, indicating how likely it is to suffer delays or need repairs. The least fun part of this vehicle is probably how likely it is for people to urinate in or around it. T: Public transportation is for the people who clean your mansion. Who wants to be stuck between a sweaty giant and a compulsively texting vedalken for their whole commute? Not a winner like you. 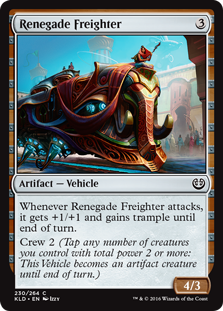 This has got to be the slowest way to get anywhere on Kaladesh, since it only takes 2 creatures to block. A billionaire could buy trains that plow through dozens of people without stopping. K: Unusually festive and decorative looking for what I can only imagine is a military weapon. If this were street-legal could you imagine the road rage issues? This one’s great for guys with deep-seated feelings of inadequacy, so it’s sure to be a favorite among Magic flavor reviewers. My favorite part is the cool wheels. T: Man, what a sweet ride! Look at that big phallic javelin launcher on top, and tell me this car doesn’t belong to a true champion. 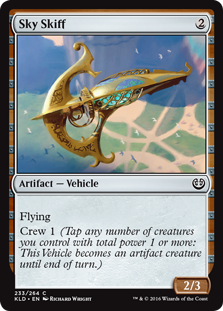 The downside is it requires at least two people to operate, so if you’ve alienated all of your friends by being too awesome, you might have to pay one of your servants to drive you around while you harpoon pedestrians in the chest. K: Well, Treasure Cruise is back. This looks like probably the most relaxing of the vehicles. I love a good ferry ride, and I love drawing cards, so this is a surefire success. My only concern would be that there might be an annoying PA system that describes local landmarks as you pass by them. 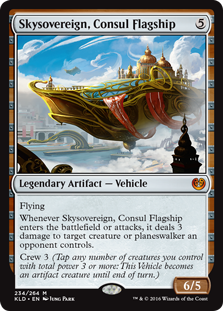 Also, the coffee they serve on board is the worst in Kaladesh. T: A houseboat can be pretty classy, and gambling is 100% legal in international waters, but this is no houseboat. The only thing more humiliating than riding a train is taking a ferry. Bomat is like the Staten Island of Ghirapur, and God surrounded both with water for a reason. If you absolutely must go there, consider taking a helicopter or private jet instead. K: Stretches the definition of a vehicle for me, since this mostly appears to just be a horsedrawn carriage, which has appeared plenty of times as a plain old creature. With an extremely easy to measure horsepower of ‘1’, it’s also not likely to provide many thrills. The apparatus at the back also confuses me. Maybe Jesse T can provide an interpretation. Either way, I’m not anxious to drive this vehicle. T: This one is a bit of a sleeper. A Cultivator’s Caravan is a real collector’s item, and hipsters love them! The antique mechanical horse screams class and subtlety, and the custom exhaust with the enormous tailpipe is a magnificently Freudian status symbol. While it’s true that it falls apart as soon as you drive it off the showroom floor, everyone knows it’s just for show, and it’s an impressively expensive addition to any aspiring miser’s hoard. K: For sure the biggest and scariest of the vehicles, but it unfortunately looks like something out of Wild Wild West or a recent superhero movie’s climactic final battle. I feel like you’d really have to be a movie villain or a Republican presidential candidate to pull something like this off. Might be worth taking a brief ride on at an inventor’s fair, but this is just not a serious vehicle. T: Nothing asserts dominance like smashing every car in the parking lot with a piece of heavy machinery. This is a great vehicle for anyone who wants to take revenge on everyone at their high school reunion. They once tried to crush you like an insect, but now you’ve got a giant metal insect chassis, and you’re the one doing the crushing! This 100-ton fashion statement would be perfect if not for its terrible gas mileage. K: This is the sweetest of the cars for sure, and comes tricked out with all the bells and whistles you’d expect from a top of the line model. Sleek body design, aether suspension, distinctive three-wheel structure, and integrated bluetooth, this baby’s got it all. Only issue is on a street drivability metric it’s definitely an attention getter. You look like a real jerk driving this thing during commute times, because you clearly have enough money that you don’t need to work. Also, be very careful where you park it, this car is begging to get hijacked. T: Style. Performance. Luxury. All of these are just words. Success isn’t a state of mind: It’s a way of life. Ingenuity. If you want to be the best, you’ve got to look the part. Leadership. Winners aren’t born. They’re made. Bold. Engineering. Quality. Are you driven? Or do you prefer to be the one doing the driving? 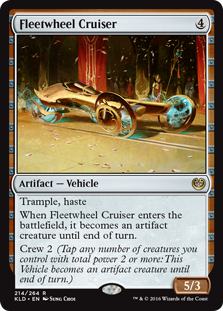 Take control of your life behind the wheel of a 2016 Fleetwheel Cruiser. Chocolate. 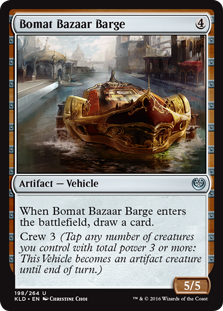 The multiverse’s finest cars are made in Kaladesh. Winners are made anywhere the road takes them. K: Not sure where a motorcycle gets 6 power and trample from, but if you’re looking to Tokyo Drift, no other ride is faster or furiouser. Beware, though, if you drive this vehicle you will probably end up entangled in some kind of action plot involving villainous Russians, explosions, and femmes fatales who are not what they seem. Is it worth it for the rush? Only you can know for yourself if you’re cool enough to take this ride. Immensely dangerous, of course. T: Your spouse and in-laws might not like explosions, but that’s never stopped you from turning on Die Hard in the middle of a family dinner before. You like to live dangerously. The banal horror of suburban mediocrity has left you with no fear of death, and if you’ve got to be having a mid-life crisis, you’re going to take everyone else along with you. You’re spiraling out of control, and you want a vehicle that reflects that. 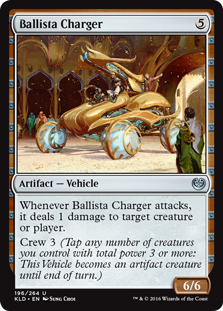 The Ovalchase Dragster isn’t for everyone, but they’re just going to have to deal with it anyway. K: I can’t help but feel that we’ve gone off the rails here, and I’m not talking about my own life and career decisions. I’m not interested in piloting a runaway train unless John Travolta or Soul Asylum are involved. Even if you do live the dream, all you’re doing is delivering cargo in an unconscionably reckless way. I’d pump the brakes on this bad boy, but I don’t think it would do any good. T: Now this train can really mow down a considerable number of people without stopping, but there’s still nothing cool about driving a train unless you’re a rich and famous newspaper mogul who owns and trades them like the Monopoly guy or Leonardo DiCaprio in his various films. I’d rather pay some loser to be the conductor while I relax in the exclusive hot tub car. K: This vehicle looks super fun, but I’m not 100% sure on its safety. What is propelling this thing and keeping it aloft? If you ignore your nagging concerns about your personal safety, it rides smooth and looks sharp. It also looks literally sharp, so be careful to not scratch anyone else’s spaceships when docking. You don’t want to know what the Consulate can do to your insurance premiums. T: Hang gliders can be pretty thrilling, but it’s not going to impress any wealthy and powerful celebrity record producers when you pull up to the club in one. For that you want a private jet. A Sky Skiff has no mini-bar, no supermodel flight attendants, and barely functional wifi. It might be a good conversation starter, but we’re looking to close deals. Hobbies and interests only distract you from the prize. K: Wow, this is one impressive airship. It’s too bad you only get it at the end of the game, when your party is too overpowered for side quests to matter all that much anyway. Far too ceremonial and recognizable for the average driver, the best you can hope for is seeing this hovering above an aetherball game. Frankly, if you end up piloting this thing you’re probably in some kind of Speed 3 nightmare scenario. T: It doesn’t get much better than this, folks. What could be classier than flying around inside of a giant replica of the Taj Mahal casino? It’s the classiest! Very classist. In fact, if I owned Skysovereign, I’d hire a crew of hundreds just to clean the toilets and fan me with palm leaves all day because I’m a job creator. I like to give back. It’s my one weakness. K: A helicopter doesn’t seem like the stealthiest of vehicles, nor one with enough storage space to make for efficient smuggling. Still, it’s great for looking at volcanos, waterfalls, or popular landmarks if you’ve got money to burn. You will probably get nauseous on this vehicle, but if you’ve got an iron stomach (and some do), it provides good speed and an efficient design. Plus it apparently has a well-stocked library for you to rummage through. T: If you’re looking for something that’s step up from Sky Skiff, but the private jet is still out of your price range, a helicopter is a reasonable way to make it to your next business meeting. Most places worth visiting have a helipad for important clients, and if they don’t, you can always just land on top of a poor person’s home or family members. 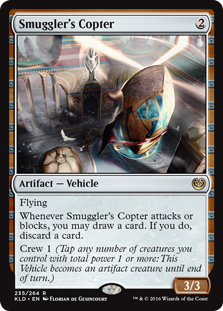 Unfortunately, Smuggler’s Copter looks kind of like Boba Fett’s spaceship, and you don’t want anyone to give anyone the wrong idea by accidentally making a reference to Star Wars, model trains, or Magic: The Gathering cards. T: Thanks for reading! I’m really enjoying the vehicle mechanic so far, and I hope this isn’t the last time we see it. 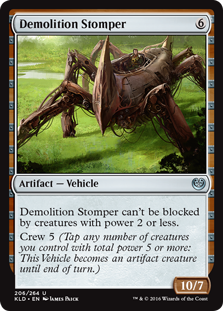 With the right designs, it could become an evergreen mechanic right along with equipment and its disgraced cousin, fortification. 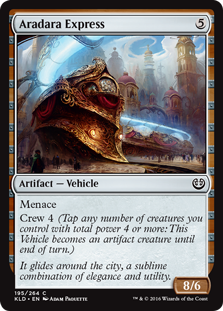 The world of Kaladesh has many wonders in store for us, and we’ve only begun to scratch the surface. If you’d like to know more about the luxurious Taj Mahal casino & resort, make sure to come back next time for Duel Decks: Trump vs. Clinton.